Why Southeast Asia is a region with many elections but little democratisation. Democracy in Southeast Asia is on the defensive. A recent map of “Freedom in the World in 2016,” from Freedom House, illustrates the point starkly. 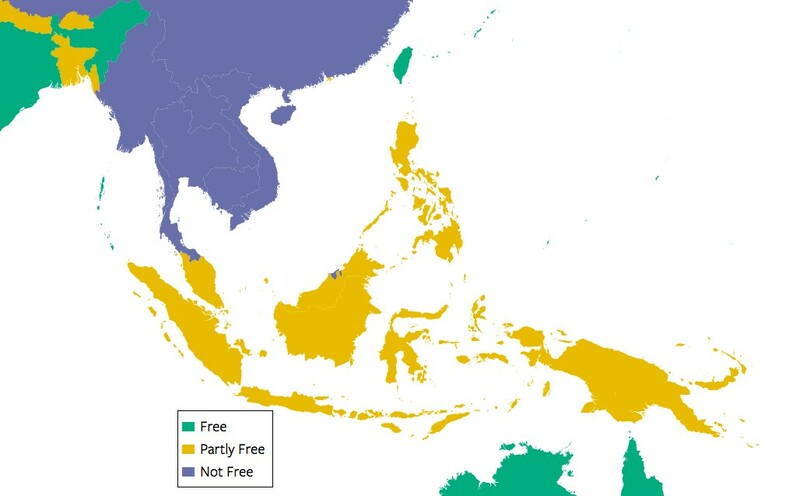 Based on their current rankings, Freedom House counts no Southeast Asian country as “Free.” It is possible to quibble with individual country evaluations, and there are other rankings of political rights and civil liberties to consult, but they all point to the same basic conclusion. Southeast Asia’s democratic deficit is an important challenge to an influential new literature in political science on the democratising power of elections. This idea, most carefully evaluated in a 2009 volume, holds that repetitive elections are not just a defining feature of democracy, they can also be an independent cause of authoritarian breakdown and democratic change. This theory of “democratisation by elections” is particularly attractive to policymakers and activists because it implies that even deeply flawed multi-party and multi-candidate elections overseen by authoritarian regimes can have democratising effects. For scholars of democratisation, it calls attention to the numerous ways that electoral authoritarian regimes attempt to manage political contestation and opposition mobilisation, with sometimes mixed results. In a new paper (PDF), we observe that this new literature on democratisation by elections has been almost entirely silent about Southeast Asia. In fact, between 1945 and 2015, Southeast Asia has seen no less than 110 executive and legislative elections under authoritarian rule. Southeast Asia is a region with many authoritarian elections but little democratisation. General propositions in comparative politics need not explain every country or every case, but when they confront an entire region of “recalcitrance,” in Donald Emmerson’s words, this calls for further investigation. Taking into account both the history of elections in Southeast Asia and the ways in which Southeast Asianists and others have thought about democratisation, and updating Robert Taylor’s conclusion from two decades ago that “elections for presidents and legislatures have never directly caused a change in government”, we argue that two sets of factors explain why elections almost never lead to democratisation in Southeast Asia. The first is state strength, which Dan Slater has considered an important antecedent of authoritarian resilience in the region. Strong states can deploy resources to target potential sources of electoral opposition, they can repress or even crush opposition movements using either the legal system or the security forces. They can also deliver broadly shared economic growth. Elections are not threats to regimes in strong states. The classic case in Southeast Asia is Singapore, but in various ways Indonesia, Malaysia, and Myanmar exhibit such patterns as well. The second factor that explains the resilience of authoritarian rule in the face of elections in Southeast Asia is neopatrimonialism. When dictators effectively use patronage to reward key supporters and bind them to support the incumbent regime, then elections are just as much opportunities to build and/or nurture these clientelistic ties as they are moments to contest incumbent rule. Cases as diverse as Cambodia under Hun Sen, the Philippines under Marcos, Indonesia under Suharto, and even Malaysia since the 1980s show elements of this neopatrimonial channel at work. What makes elections dangerous for authoritarian regimes in Southeast Asia is the combination of state weakness and the evaporation of patronage resources. The Philippines in 1986 is the best candidate for a democratising election in Southeast Asia. Here, Marcos presided over a weak state in the midst of a long-term economic decline, and then held a deeply flawed election that effectively galvanised opposition forces against his rule. Under these particular conditions, democratisation by elections worked as the literature expected. However, our close examination of other cases of democratisation in the region—several instances in Thailand, and Indonesia in 1999—reveals that even when elections coincide with democratisation, the causal process often works differently. In these cases, elections mark the culmination of the democratisation process rather than causing democratisation on their own. In this way, taking Southeast Asian cases seriously tells us not just about the limits of democratisation by elections within one world region, it can also help others to reconsider democratisation by elections as a general theoretical proposition. For example, Africa has figured very prominently in the literature on democratisation by elections. Why that region in particular? The Southeast Asian experience suggests that what would make African states particularly vulnerable to democratisation by elections would be state weakness and the evaporation of patronage resources. The comparative weakness of African states is an established theme in history and the social sciences, as is the failure of patronage mechanisms in the era of structural adjustment, which might explain why democratisation by elections is so much more common in this region. Within Southeast Asia, though, the implication is that elections are best understood not as independent causes of democratisation but rather as venues through which regimes and their opponents deploy the resources at their disposal. Rather than examining the venues in which political actors compete, activists and analysts alike might instead consider the resources that they bring to the competition. Lee Morgenbesser is a Research Fellow at Griffith University. Tom Pepinsky is Associate Professor of Government at Cornell University. America should top Freedom House’s ‘Countries to watch in 2016’. Good grief, Mr smarty pants professors. Busy studying theory with theories, huh. Go there, live there, work there, experience reality and then you would no longer “study”, but perhaps, “Act”. And besides; what good do your study-theories do for the people there? Value of your “observations and studies”? Except, you may want to take your studies and get another DR or Prof.. Studying authoritarianism rather than democratization might make sense.